Happy Holidays!!! I hope you are all having a great holiday season with family and friends. I wanted to share with you a couple of dishes I prepared on Christmas eve. Last year in our house we started to make the 7 fishes. Since my husband and I come from Italian descents, we wanted to keep this in our family to share with our kids. Well this year I wanted to step it up. In the next couple of posts I will share some of the dishes that I prepared. I am going to start out with Shrimp and Grits. I love some creamy, cheesy grits. I think they can be prepared with pretty much anything. 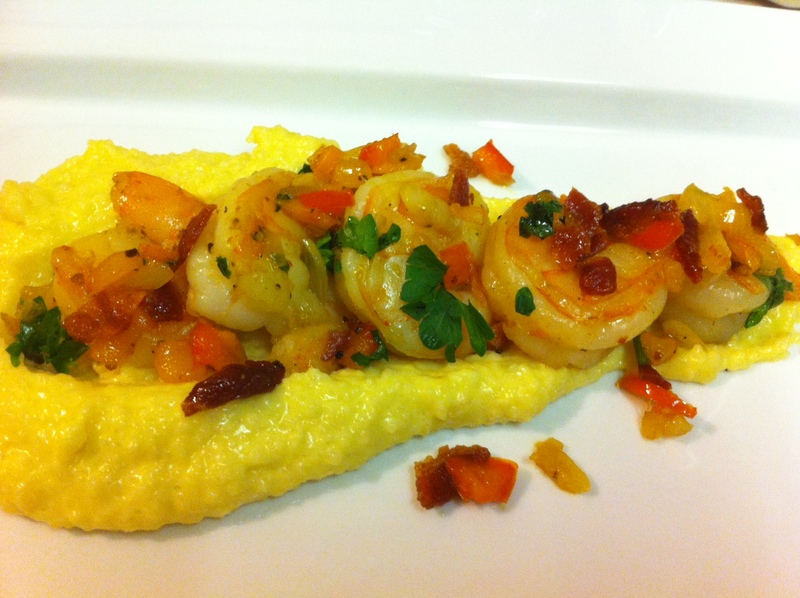 The shrimp with some sweet peppers and shallots went along great with the grits. Then I topped it off with some crispy bacon. This is a pretty easy dish to prepare at your next gathering or for a weeknight meal. Next Post 2 Years of Homemade Delish!! One of the main reasons I get so homesick around the holidays is because I miss my mother’s take on the ‘7 fishes’, too 😀 This looks delicious. Creamiest grits I’ve ever seen! She just couldn’t pass this up!